While virtually anyone can draw up plans and call themselves a building designer, only a registered architect can use the term ‘Architect’. Unfortunately the real difference between a building designer and architect is not widely understood by the community. The Board has introduced a Registered Architects logo and encourages architects to display this logo and their registration number on business stationery, plans, brochures, office signage and project sign boards. The logo is a unique symbol that lets the public and clients know the person they are dealing with is a professional. Click here to download the Registered Architects logo. 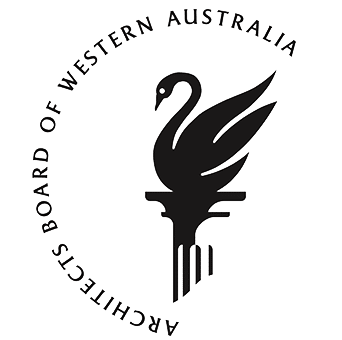 The Board protects consumers of architectural services in Western Australia by ensuring only properly qualified and competent persons are identified as architects or practise architecture. If you believe the title “Architect”, or any associated word such as “Architecture” or “Architectural”, is being misused by a person who is not registered by the Board, or a corporation that is not licensed by the Board, please contact the Board’s offices. Professional indemnity insurance is required for all practising architects and licensed corporations in Western Australia. The minimum amount of professional indemnity insurance cover required is $1 million. Professional indemnity insurance is required for all practising architects, either as an individual or through an employer’s policy. Practising architects that provide their services as sub-contractors to other architects or licensed corporations need to be covered by professional indemnity insurance, either through the policy of the architect that is contracting their services or their own insurance policy. Architects undertaking private jobs outside their employment are generally not covered by their employer’s policy, and they need to establish their own professional indemnity insurance cover. Practising architects that are based overseas are still required to have professional indemnity insurance in place. Professional indemnity insurance is not a requirement for renewal of registration for non practising architects however, advice should be sought from insurers as to whether ‘run-off’ insurance is required in order to meet any on-going obligations from previous projects. Please click here to access the Board’s Information Sheet regarding Professional Indemnity Insurance. The Architects Act 2004 requires the Board to be satisfied that an architect has attained or maintained an appropriate level of knowledge, skill and competence in order to renew a person’s registration (section 36(2)(a)(iii) of the Act). In administering the requirements of this section of the Act, the Board uses the acronym CPD which refers to continuing professional development. The Board has developed a CPD Framework whereby practising architects are required to obtain a minimum of 20 CPD points each year. The Board encourages architects to undertake CPD that complies with this CPD Framework and this is the Board’s preferred method for an architect to demonstrate maintenance of an appropriate level of knowledge, skill and competence as at the date of renewal. However, it will accept other means of satisfying section 36(2)(a)(iii) of the Act. Practising architects are required to keep records of how they have maintained an appropriate level of knowledge, skill and competence, including any professional development activities undertaken. The Board has developed a CPD Record Form titled “Form 09 – CPD Record” which can be viewed here. The Board encourages architects to use this CPD Record Form or to keep similar records. This does not preclude an architect from providing evidence of CPD in some other form. Continuing Professional Development (CPD) for architects is provided by many organisations such as the Australian Institute of Architects, government organisations, private providers, universities and other education and training organisations. The Board does not accredit CPD Providers as activities provided by any organisation can qualify for CPD points, so long as the activity complies with the Board’s CPD Framework, which can be viewed here. Further information on CPD providers can be viewed here. indicated on his/her previous renewal of registration form that their CPD requirements were not met. The Board reserves a discretion to include other architects in the audit process where it is reasonable to do so. When an architect’s name is selected for audit and his/her submission has been assessed as satisfactory, the architect’s name will generally be removed from the random selection process for a 3-year period. Note that if the architect’s inclusion in the audit was for a reason other than random selection, the architect may be selected for a further audit within the 3-year period. Similarly, if the architect has been off the practising division of the register for more than 2 years, the Board may consider it appropriate that the architect be the subject of a further CPD audit within the 3-year period. Where an architect is selected for an audit, and has successfully passed an audit by another Australian architect registration authority in the past 3 years, the architect will be deemed to have satisfied the Board’s audit requirements. The objective of the Architects Board Award is to recognise architects registered in Western Australia whose attitudes and personal contributions to the profession and community have enhanced public confidence in the standing of the profession and/or promoted public awareness of the profession. The Board Award is not intended to recognise the successful career of an architect, achievement in building design or academic excellence. Rather, it is awarded to recognise special endeavours outside of those considered to be the normal business activities of an architect, which may otherwise go unrecognised. If you would like to nominate an architect for the Architects Board Award, please click here to access the Nomination Form. For further information regarding the National Standard of Competency for Architects and pathways to registration as an architect, please visit the Architects Accreditation Council of Australia website. Please click here to view the Board’s latest Newsletter.